Has it been a dry summer where you are? We’ve had so little rain over the past six weeks that Innkeeper Dave has been turning off the Andrews Geyser overnight in order to replenish the lake fed by Mill Creek and the creek itself. He then turns it back on before breakfast so the geyser comes back for the daytime tourists. The pipe to the geyser runs two miles down the mountain, carrying water from our lake to the geyser. 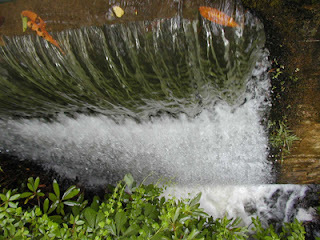 When there’s an ample supply of water, a pleasing-to-the-eye waterfall effect occurs off the dam. It sounds nice, too. Best views of the waterfall? From the Lake View suite, and from the Solarium where we serve breakfast. This entry was posted in Uncategorized and tagged Old Fort / Andrews Geyser, Summer by Inn on Mill Creek. Bookmark the permalink.